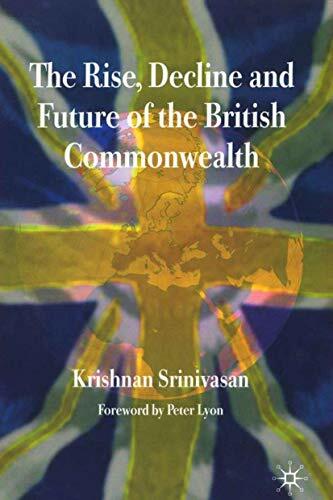 The Rise Decline And Future Of The British Commonwealth: 9781403987150 Hardcover - LIMEROCK BOOKS INC. Written by a senior Indian diplomat who has until recently also served as Commonwealth Deputy Secretary-General, this book provides a unique and far-reaching exploration of the British Commonwealth, and its impact since the second World War on the process of Britain adjusting to a world without Empire. Whither the Commonwealth now? What is its record of achievement; what are the benefits of membership to countries in terms of collective political influence, trade, investment, aid, travel and education? Can any practical good be envisaged for this nearly moribund post-colonial organization? Britain, which brought the association into being and is central to it, would have to play a key part in determining its future. But in coming to such decisions, the British Government faces great problems of perception, both from the Monarchy and the British public. KRISHNAN SRINIVASAN is a former senior Indian diplomat (Foreign Secretary, i.e., permanent secretary), and former Commonwealth deputy Secretary-General, a Visiting Fellow of Wolfson College, Cambridge, Visiting Fellow at the Centre for International Studies, Cambridge, and a Senior Research Fellow at the Institute of Commonwealth Studies, London University, UK.<br /><br />PETER LYON is Reader Emeritus in International Relations and Senior Research Fellow at the Institute of Commonwealth Studies, University of London. He is Editor of The Round Table: The Commonwealth Journal of International Affairs.